Over time, even the most durable roofing becomes unusable and have to be replaced or all fully coated, or some parts of the roof. Often, during cleaning of the roof from the ice and snow damaged roofing: fly klyam-up and nails, there are deep scratches and even cracks on the surface. As a result of entering the hollows moisture causes corrosion of the roofing material and disorders inside temperature of the building. If you do not fix such damage, and do roof house roof repair, that such coverage would come into complete disrepair after a year-half of the torus, and it will have to re-lay. Often premature deterioration of the roof provoke disclosure of sutures in welts and education along the lines of bending cracks, which may also appear on the surface of the troughs, funnels and drain pipes. Folds can be restored in the following way: uncover and re-clamp the standing seam; press, covered with paint or varnish, then good fluff Surikova putty recumbent folds. Surikova putty ingredients are 2 part of the natural drying oils, 1 part of red lead, attrited into powder, 2 part of white and crushed 4 parts chalk. If the mechanical stress undergone trough, it should first remove the damaged areas, and then put in place a new steel sheets. The seams in this case you need to connect a double bed-seam and fluff Surikova putty. In that case, if the surface of the trenches formed small, up to 3 mm, cracks, they can be repaired with the help of Surikova putty. Large holes are best to stuff rags, or a piece of burlap soaked in thick oil paint in historical sources of felt. To correct hole, the dimensions of which do not exceed 14 cm, should be on the roof, pre-cleaned from dirt and dust and the processed linseed oil, apply patch, attaching it with the help of the oil storage facilities, tumnoy mastic. Patch should cover the damaged area on all sides by at least 10-12 cm. Portions of the roof with a hole more 14 see close up Steel sheets. This patch is placed in the entire width of the picture either fix, positioning it along the battens between the two standing seam thus, to the new seam (a junction old roofing sheet and patches) I am lying on the basis of, but in any case not between battens. Should be prepared in advance a sheet-patch, why you need to bend the edges for lying and standing seam. Then, the patch is applied to the injury site and are connected primarily with immobile seam roofing, and then with the standing. If necessary, replace sheet coating, should take a new one and connect it with single or double bed-folds with old sheets. The resulting joints is important to carefully fluff Surikova putty. If the sheet wall gutters corroded, it should be replaced by a new, to connect with the neighboring via double recumbent folds. 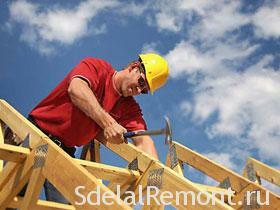 Repair of the roof may include steel sheets as new, and suitable old. Pre old material to be cleaned from dirt and dust, a new factory to erase grease, and then proolifit surface sheets on both sides. If the damage of the roof cover sheets should be changed in small patches, to prevent moisture from entering under the roof, into the attic through the resulting "window". First of all, on the prepared sheets folded edge, and then combined by two or three pictures in the width. If the picture will be placed in the length of the roof, they must be connected on the long sides of single or double standing seam. To protect the coating against the negative effects of condensation, You must be running on the lath boards or boards, as well as the roofing material covered by two layers of paint and dry thoroughly. steel sheets, re-arranged, is attached via a T-shaped crutch (on eaves) and-clamp (to batten bars). Upon completion of repairs should be covered with paint roof, purified from dust and dirt. The coating must be checked for defects, and it is best to do it together. Roofer, located in the attic, when detecting holes or cracks thud gives to know about it to his assistant, chalk is marked damaged areas. Small cracks sealed via Surikovoj putties. The limbs must be carefully paint over, removing excess putty knife, followed by a score crack a piece of canvas or burlap and cover paint. It is recommended to soak the patch in a drying oil or a few minutes to hold in solution, prepared from iron or lead minium and natural drying oil. Wrung cloth to put on the surface of the coating, tightly pressed and carefully smoothed with a spatula or by hand. When the patch is completely dry (for 6-7 days), dust-roof must be covered with paint. If rust on the surface of the roofing sheets is formed by the attic, damaged areas should be cleaned thoroughly, using a brush with stiff bristles, and cover two or three coats of paint. Only after the removal of all defects (holes and cracks) on both sides of the roof covering can begin painting. 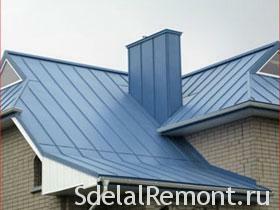 To get a shiny and smooth surface of the roof, you need to seriously consider the choice of colors. It is necessary to choose only prepared based on natural linseed oil. paint quality deteriorates in the case, if its preparation using Coarsely pigment or a mixture of linseed oil and dry ink and wherein the ingredients are stirred manually. Ordinary coating stained with a large centrifugal brush. The paint should put a thin uniform layer of the first eave, and then, in front of, from the ridge to the eaves. When applying paint excessively thick, it can wrinkle or cracking after drying. When used in such cracks will be celebrated moisture accumulation, that provoke premature coating. Downspouts removed before staining and thoroughly cleaned from dirt and dust, then coated with several layers of oil paint. In addition, each layer must be thoroughly dried, otherwise the paint surface bulges and blisters formed on it after drying. To prevent the formation of rust on the cover and further corrosion, you need to paint with a sprayer or brush applied to the surface of the special rust converter. By reacting with rust it provokes the formation of a protective layer of phosphate, protecting steel roofing sheets from damage. Especially for site renovated apartment with his hands. Is it possible in the top of the rectangular shingles to make replacements of several elements without having to replace a very large area of ​​the roof?